The Cruisers is the most expensive series of motorcycle offered by Triumph. There are three Cruiser models included under this series. Thunderbird strom is the least expensive while Rocket III Roadster is the most expensive variant. All the versions of this series have classic design. There are two engine options in this series. The other specifications are given below. 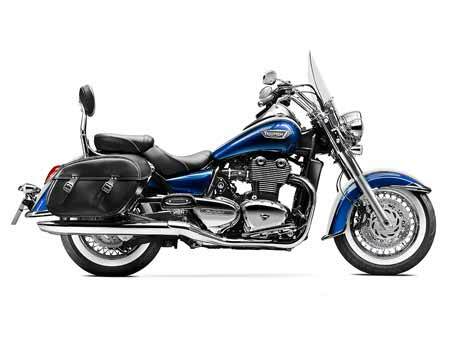 Thunderbird Storm – This version has been equipped with 1699 cc engine, has manual transmission, 19 kmpl mileage and ex-showroom price around INR 14,61,503. Thunderbird LT – This version has been equipped with 1699 cc engine, has manual transmission and ex-showroom price around INR 16,96,330. Rocket III Roadster – This version has been equipped with 2294 cc engine, has manual transmission, 19 kmpl mileage and ex-showroom price around INR 22,29,230.